Ghost Rider Johnny Blaze Is Not Coming to Agents of S.H.I.E.L.D. Agents of S.H.I.E.L.D. has done a pretty good job of keeping fans interested without really bringing in any A-list Marvel superheroes. Sure, characters like Nick Fury have made very brief appearances, but for the most part, it has been lesser known names driving the show. That changed this year (sort of) when they brought on Ghost Rider, but even that was the lesser known Robbie Reyes version of the iconic Marvel anti-hero. Those holding out hope that the more popular Johnny Blaze version would come to the show should probably let that go, because the producers have confirmed it isn't going to happen. Executive Producers Jed Whedon and Jeff Bell recently spoke with IGN about Agents of S.H.I.E.L.D. and the subject of Ghost Rider came up. When discussing the "good samaritan" who gave Robbie Reyes his powers, the pair wouldn't even confirm that it was Johnny Blaze who did it, but their response ensured that either way, he won't be coming to the show. Here is what they had to say about it. "There is a tradition within the comics that there's been many Ghost Riders and our take on that was they're not simultaneously a tribe of Ghost Riders but that it's passed. The Spirit of Vengeance is passed from person to person. In that respect, at least our intention was that the Spirit of Vengeance was passed from one person to another. And who passed that on, there are suggestions within the storytelling ... That's as far as we're going to take that part." So until Robbie Reyes can pass on the Spirit of Vengeance to someone else, there is only going to be one Ghost Rider in the world of Marvel's Agents of S.H.I.E.L.D. And unless that person happens to be named Johnny Blaze, it probably won't ever be Johnny Blaze. Without saying so, it seems pretty clear if you read between the lines, that the Spirit of Vengeance was passed from Johnny Blaze to Robbie Reyes. So the few seconds of screen time he got in that flashback sequence earlier in the season is all we're likely to get. Despite being a much less popular version of the character, Ghost Rider has been a very popular addition to Agents of S.H.I.E.L.D. and people have really taken to Gabriel Luna's portrayal. There has even been some talk of him getting a Ghost Rider spinoff show, but there hasn't been any real movement on that. 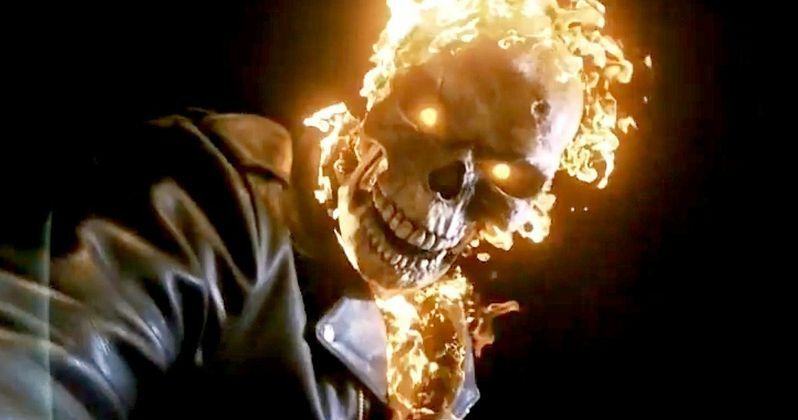 At one point, before the character ever appeared on Agents of S.H.I.E.L.D., there was talk that Netflix was developing a Ghost Rider series, but that seems to have either passed or been shelved at least for now. At the time it seemed likely that the show would have focused on Johnny Blaze and since he won't be showing up on Agents of S.H.I.E.L.D., that is still a possibility, assuming that Marvel decides to use him elsewhere. If Marvel does have plans to use Johnny Blaze somewhere else in the Marvel Cinematic Universe, that could explain why Jed Whedon and Jeff Bell were reluctant say that name directly. If Marvel had eventual plans for Ghost Rider outside of Agents of S.H.I.E.L.D., that would definitely explain why Robbie Reyes was the version of the character they decided to use in the first place. Even if Johnny Blaze doesn't show up on Netflix or in an MCU movie in the future, don't expect him to come face-to-face with Agent Coulson on Agents of S.H.I.E.L.D.